Bistro Blu at Mercure Charlestown is situated on the peak of Madison Drive, in the convenient and central, ever expanding suburb of Charlestown. Located in the tree tops and away from busy roads, our restaurant and function facilities are the perfect place to relax for business travellers, family occasions or special events. Take in the view of Stockton beach and the serene tree top outlook from the restaurant deck, or enjoy a drink in the sunlit bar. We had a lovely dinner, thank you. The only thing was the chairs in the restaurantthe were very uncomfortable. Overall lovely meal and staff were very friendly. Great food and service in a very pleasant location. Definitely be back. Great service, food was fantastic - very enjoyable. I was surprised by the quality of the food and it was ver y well cooked. Great wine at reasonable prices. We had a great night with friends. Met in the comfortable Bar before our meal. Presentation of each course was superb. Each of our meals were mouth watering. My total experiece was great . The staff very friendly . I have written 2 reviews on Bistro Blu. Our 3 courses were all superb!! It is the best meal I’ve had on Newcastle for years! The best steak I’ve had since leaving Argentina!! 100% for quality, ambience and 110% fir the service! What a delightful, relaxed evening. Thank you. Great value with the big breakfast available in this deal in addition to the buffet spread providing coffee, juices, fruits. I was happy with food & service. Will certainly be back. Dinner and breakfast good value for money. My visit on 4th March 2019 was the result of receiving a Groupon Dinner for Two Gift Voucher and it is a pleasure to commend the quality and presentation by the chefs and staff member Brittany. The whole experience was excellent and beyond expectations. G.Stewart Rankin Park NSW. The only negative I have is that we requested another round of drinks after entree and we were told to take a seat and the waitress would come over and take our order. We left after our dessert without ever getting served a 2nd drink. The only drink we received was the one included in the voucher. The food was superb!! Hot breakfast selection wasn’t particularly extensive, but what we did have was tasty. A very nice experience in a quiet restaurant with a good view overlooking parts of Newcastle. Our continental breakfast was full of great choices too. Fantastic food and service, and the view is beautiful. Cosy dining area, tastefully renovated. I was staying at the Mercure and we had two family reunion evenings at Bistro Blu. The St Valentine's evening for 5 and the following evening 4 of us who had been the previous evening. The food was delicious, big ups to the chefs and the staff who were very helpful. 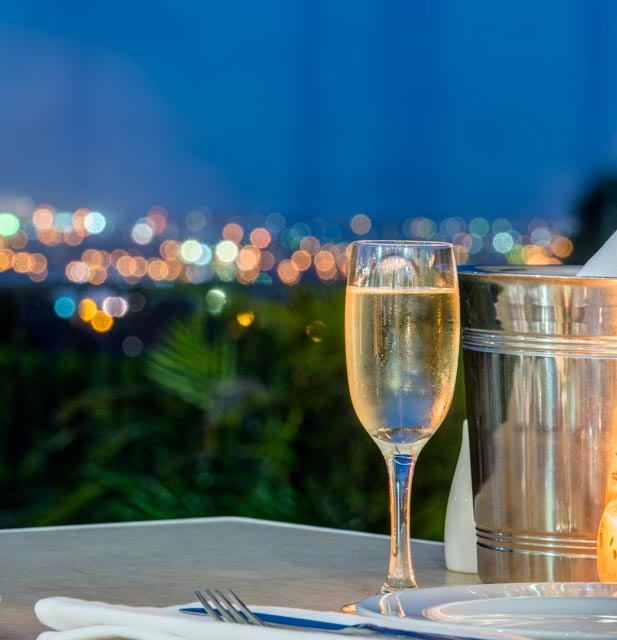 They even set  up a table on the terrace, the second evening and we could see the sunset and the city lights later.A tip for any guests: check out the menu online and be ready to order soon after arrival as the staff are caring and wish to have the dining meals arrive promptly. The kitchen is also servicing the Hotel room service, and with yummy food there is a high demand. These evenings were perfect for our family reunion. Many thanks for making it special without fuss.